Looking for a hill where the powder is plentiful and the lift lines are short? Look no further than Mount Baker Ski Area. 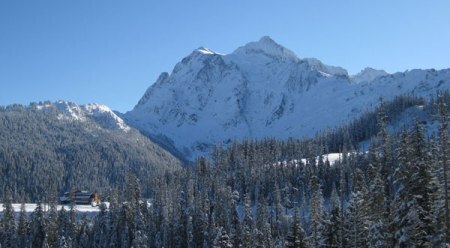 Easily accessible from both Vancouver, British Columbia, and Seattle, WA, Mount Baker holds the current World Record Snowfall with 1,140 inches during the 1998/99 year. The yearly average snowfall is 647 inches and it’s not uncommon to get 14 inches in a single day. By comparison, Vail, CO, averages only 350 inches and Squaw Valley 450 inches. Situated a reasonable eighty-minute drive from bustling Bellingham, in the northern Cascades, Mount Baker is truly a skier’s and snowboarder’s delight, and yes, they both coexist happily on this exceptional mountain. The sport of snowboarding was pioneered at Mount Baker. It was one of the first areas to encourage snowboarding and is still home to many world-class boarders. Mount Baker currently hosts the longest-running snowboarding event in the world. This year will see the 26th annual Banked Slalom event, which attracts racers and spectators from around the globe. Skiers are also welcome at Mount Baker and come for the stunning panoramic views, the well-groomed runs, the seemingly unlimited powder, and the challenges that the mountain presents … for all levels of proficiency. In addition to all of that, it’s one of the best value lift tickets anywhere! Daily lift tickets for adults on weekends are just $49.50. Youth, Senior, Super Senior and Weekday rates are also available. For this very reasonable sum you can explore 1,500 vertical feet serviced by eight up-to-date quad chairs. The drive to Mount Baker is worth the trip whether you ski or not. The Mount Baker Scenic Highway follows the valley past manicured Christmas tree farms and beside the North Fork Nooksack River through ancient stands of towering cedars and hemlocks. On the way up, be sure to stop at the Wake ’n Bakery in Glacier for a shot of caffeine. Across the street is the legendary Mount Baker Snowboard shop. Often, due to the temperate climate, the road along the valley is bare and wet. It’s only during the last ten miles that winter conditions exist as the ascent to the mountain begins. The panoramic views make it difficult to keep your eyes on the road! After a day on the slopes, you’ll be feeling ravenous. Luckily, several excellent restaurants litter the way home. Choose between traditional pizza and beer or gourmet Italian. The first possibility is the newly opened Chair 9 restaurant, near Glacier, where oven-baked pizza awaits. In Glacier, you could stop in at Milano’s for gourmet Italian food. Be sure to scan the daily specials before ordering! Across the highway is Graham’s, a feature in the area for more than a century. In this restaurant, you can warm yourself beside a wood stove that’s been enjoyed by movie stars and locals alike. If you’re looking for a funkier ambience, travel down the road to the North Fork Beer Shrine. This microbrewery is home to a fabulous collection of vintage beer cans and bottles, as well as legendary thin crust pizza. 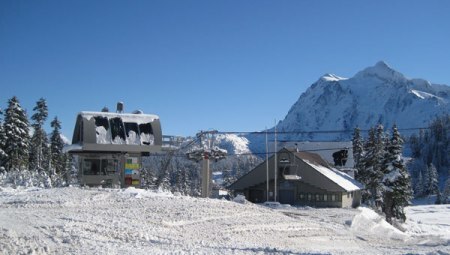 There are no accommodations on the mountain as the ski area is located within the Mount Baker-Snoqualmie National Forest. However, lots of cabins are available for weekend or weekly rental in or near Glacier, a short twenty-five minutes from the hill. Those who prefer to stay in a city can scoot down the highway for another hour to Bellingham and find everything you’d expect in a vibrant, growing community. Take I-5 to exit #255 and follow highway #542 to the end. If you wish to purchase this article for your publication, you can contact the author directly here.